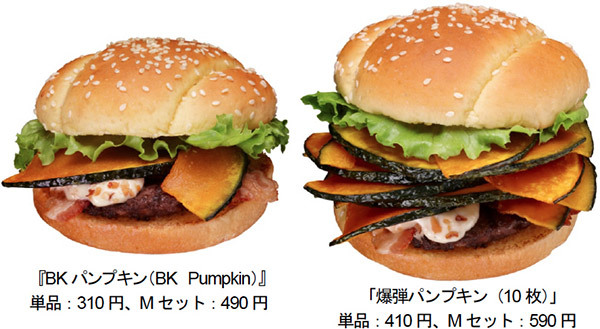 This seasonal treat is actually made with kabocha, but I guess “Squash Burger” didn’t have quite the same ka-ching to it. 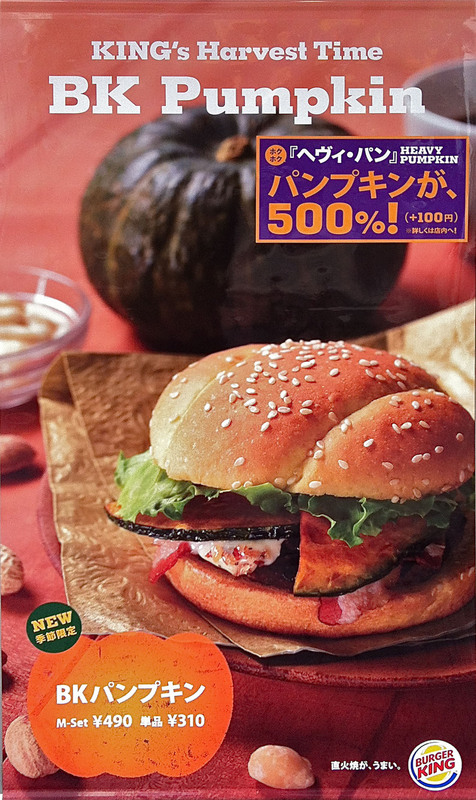 This Pumpkin Burger from Burger King Japan is not only topped with slices of roasted orange vegetable, it also features a special mayo sauce chock full o’ peanuts, almonds, cashews and hazelnuts, go figure. If you’re a real glutton for pumpkin punishment and two measly slices of squash on your burger isn’t enough, order a Pumpkin Bomb and they’ll pile on eight more for an additional two bucks! Squash-a-licious! Judging from the photos, they serve it skin-on? Hmmm. Yes, here it’s always skin-on. But the kabocha they sell in Japan has a really thin skin, so it’s not a problem. I never made anything with kabocha in the U.S. – is it the same? Oh I think I would have to try that if I was in Japan. I love kabocha! We peeled ours; seemed like it needed it. Although maybe cooked, it would’ve been tender. We’ll have to experiment! I never would have left the skin on if I hadn’t eaten a kabocha dish made by a Japanese friend, who left it on. The kabocha was sliced thin, though, so there was only a sliver of skin on each piece. Don’t know if I’d leave it on if I was cutting it in chunks. I never used to like squash of any kind in the US, but I love the way it’s made here in Japan. My friend makes a dish with kabocha cooked with soy sauce and mirin and onions that’s totally yum. I bought one last night so I’m making it for lunch today. Too bad I don’t have an onion, that sounds really good. If it turns out good I’ll put a post up about it! I’m enamored of Gower’s kabocha and red cabbage salad. In fact I’ve been cooking my way through The Breakaway Japanese Kitchen and finding all sorts of unexpected delights. Yeah, Gower’s book is amazing, isn’t it? He puts stuff together that I think, hmm, maybe ewww, but it’s always delicious. An act of faith, rewarded. heh.